How Darko Grncarov tricked Serena Williams and the BBC. Photo illustration by Lisa Larson-Walker. Photo by George Doyle/Thinkstock. How a 20-year-old from the land of fake news tricked Martina Navratilova, Serena Williams, and the BBC. Last month’s Australian Open probably should’ve been the most politically charged grand slam event ever. Tennis legends Billie Jean King and Martina Navratilova said they would’ve refused to play at Margaret Court’s namesake arena at Melbourne Park on account of Court’s recent spate of homophobic and transphobic remarks. But the active players at the sport’s first major tournament of the year took no such stands. Likewise, when controversy erupted over Tennys Sandgren’s Twitter account—on which the American journeyman engaged with alt-right leaders, endorsed Pizzagate, and said a gay club made his eyes start “bleeding”—no players at the Australian Open spoke up. Grncarov won admirers on social media for “leading the way on social issues.” His stance on Margaret Court Arena also earned the young Macedonian an interview on BBC Radio. In that conversation, Grncarov shared more of his miraculous back story: The woke young tennis player, it turned out, had just awoken from a coma, and he was preparing to make a splash on the ATP tour. Media reports hailed his miraculous recovery and imminent return to the professional ranks. Serena Williams followed him on Twitter. Player-turned-announcer James Blake said he hoped “to be commentating on plenty of big matches of yours.” After he announced that Adidas had “offered me sponsorship,” the company tweeted at him, “Welcome to the family, Darko.” The racket company Wilson, he said, was sponsoring him, too. If Grncarov seems too good to be true, that’s because much of his story isn’t true. The legend of Darko Grncarov is fake news, from the country that helped invent the phenomenon. Not everything about Grncarov is phony. There is a real person by that name, and he does play tennis—or at least he did at one time. But before Grncarov played his first and only sanctioned match, he was celebrated for great performances that almost certainly never happened. In December 2014, a local news website in Grncarov’s hometown of Strumica, Macedonia, reported on his unlikely success at a junior tournament in Amsterdam. That tournament was said to have taken place at Tennisclub Kattenlaan, which is a real place. There is no record of this supposed tournament, however. Two of Grncarov’s supposed opponents at that event were Belgians Xander Weis and Jans Clement; I was unable to find any record of a Belgian tennis player with either name. His purported semifinal foe, Denmark’s Benjamin Hannestad, was in fact a highly ranked junior and now plays for Arizona State University. Hannestad was nowhere near Amsterdam that week, though—his International Tennis Federation profile shows he was competing at elite junior tournaments in Florida that week and the week before. The coverage of Grncarov’s alleged success extended into television the next week. The young player appeared on a Strumica TV show, showing off a trophy and speaking in vague terms about his life in tennis. B-roll footage of him actually playing tennis—unimpressively, it must be said—accompanied the interview. Five months after that seemingly nonexistent event in the Netherlands, Grncarov did take the court at a junior event, the 2015 Podgorica Open in Montenegro. He was blanked 6–0, 6–0 in the first round of qualifying by Nikola Vukotic, a player who won just one other match in seven years of junior tennis. Reached on Facebook, Vukotic said “result can tell you everything” about the quality of his opponent, though he acknowledged he didn’t remember many details about the match. Grncarov entered his first pro tournament two years later, as a wild card into the qualifying of a small ITF event in Sharm el-Sheikh, Egypt. He withdrew before his match was played. That withdrawal is the lone entry on Grncarov’s professional ITF profile, meaning he’s never been in the draw of any other sanctioned tournament. Despite Grncarov’s no-show in Egypt, the Macedonian media hailed his triumphs there, with the website Strumica Denes publishing reports about his wins over Leonid Avramenko of Russia and Elmar Ejupovic of Germany. These are real players, but they’ve never played Grncarov. Ejupovic played in the tournament but lost his first match that week to Iouri Syromolotov Netrebina of Spain. Avramenko wasn’t entered in the Egyptian event; he didn’t play any tournaments between February and June 2017. Aleksandar Bojadziski, who writes about sports for Strumica Denes, said he posted the two stories based on information he’d received from Grncarov, only to discover the results were fake when he later checked the ITF website. As members of the local media cooled on Grncarov, his story caught fire on Twitter. The buzz began to pick up last summer, when a fleet of accounts began incessantly retweeting, liking, replying to, and generally worshiping Grncarov. I’ve found more than 200 Twitter accounts solely devoted to Grncarov, some of which have garbled names (@bdusbsisnw, @niiiichduebsi1, @nfjsbajsnxjx1). Others have monikers related to tennis (@atptennisnewsr, @wtasportnews, @usopenfans) or are named in honor of Grncarov himself (@fans_darko, @darkofans1, @portalgrncarov). These Twitter accounts often yammered about the same topics simultaneously, whether it was Darko’s crush on Nicole Scherzinger or his purported net worth of $1.5 million. Some even appeared to be designated haters, posting negative comments about Grncarov only for the other accounts to rally to his defense. 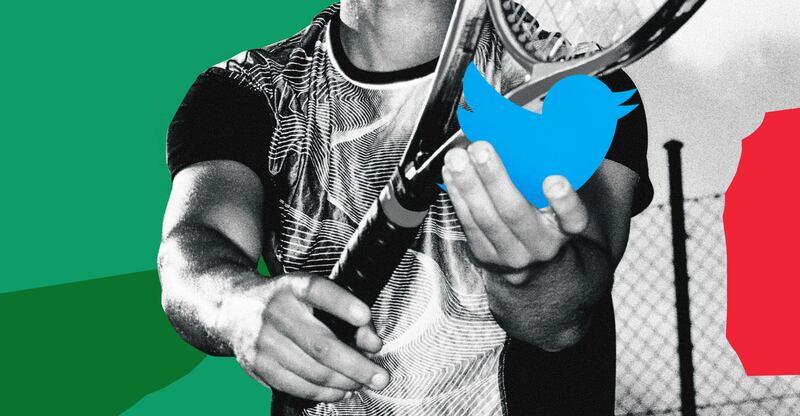 This army of Twitter users also worked in concert to badger prominent Twitter accounts, including @ATPWorldTour and @ITF_Tennis, into following the Macedonian tennis player. They also repeatedly pestered Andy Lassner, an executive producer on The Ellen DeGeneres Show, to invite Grncarov on as a guest. Though his story was shared by a few accounts, Grncarov didn’t gain wider traction online until months later, when he began to praise the Williams sisters. Fans were quickly drawn to this young male player who seemed to idolize his female counterparts, an exceedingly rare occurrence even in the mixed sport of tennis. Journalists, too, latched onto Grncarov’s amazing comeback story. The first non-Macedonian news item about him, which appeared on the French website TennisActu on Sept. 11, said he’d emerged from a coma and detailed his plans to play elite ATP tournaments in Rotterdam and Miami in 2018. Metro, a British newspaper, published a long “exclusive” report on Grncarov in November. That piece said the coma had lasted six months, and indicated that Grncarov’s serve reached 138 miles per hour, which would make it one of the fastest in professional tennis. Metro also mentioned that Grncarov listed Serbian player Viktor Troicki—who’s been ranked as high as No. 12 in the world—as a practice partner, and it included an Instagram post from an account in Troicki’s name that touted Grncarov’s remarkable story. Another outlet, Tennis World, said Grncarov and Troicki would play doubles together in Miami this March. Despite the holes in his story, Grncarov’s profile continued to grow. Diario Sport in Spain published a report about him, as did New Indian Express and sites in Argentina, Serbia, Italy, and Japan. An ATP tournament in Mexico made a video about him for Twitter. 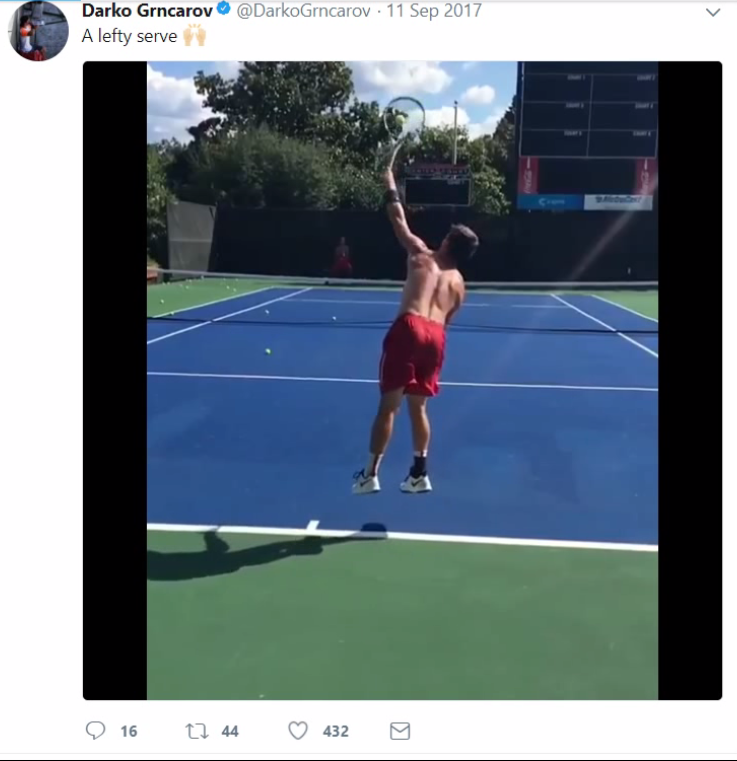 Grncarov, meanwhile, posted videos and photos of himself training for his “return.” The videos clearly show different people—sometimes the player depicted switches to being left-handed. Most show a man only from behind, or with his face obscured. Several of the videos were taken from the Instagram account of Cameron Henricy Trigolos, a junior player from Spain, including one in which you can clearly hear people speaking Spanish. (Henricy Trigolos did not respond to a message seeking comment.) Grncarov, who had more than 15,000 followers on Twitter and more than 41,000 followers on Instagram, racked up thousands of likes when he posted the pilfered images. By this point, that chorus of 200-plus Grncarov-loving Twitter accounts had been joined by a growing number of genuine supporters. Tennis fans celebrated the images Grncarov shared; one even said he was inspired to practice hitting his forehand like Grncarov did. On five separate occasions, photos Grncarov posted were featured on the account @ATPThirst. “Can I call Darko my new fave even if I’ve never seen him play?” one Twitter user asked. 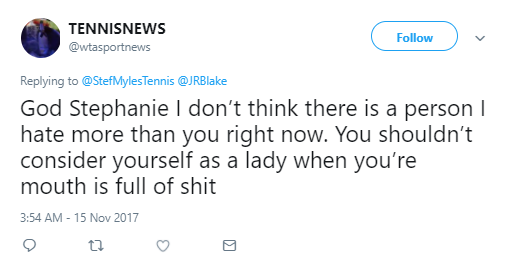 “He’s like a player Tennis Twitter built in a factory,” another said in reply. Court, who won 24 Grand Slam singles titles during her career, said last year that “tennis is full of lesbians” and skipped this year’s Australian Open after the country approved gay marriage in a nationwide referendum. “The thing is that I simply cannot respect someone who has offended so, so many people, and what she did was simply disgusting and not human at all,” Grncarov told the BBC, speaking in clear English with an Eastern European accent. “Is it for you sad that the world of tennis, your fellow professionals, are not coming out and taking your response to this?” Adebayo asked. Grncarov continued to speak out during the Australian Open, blasting Sandgren for a 2015 tweet in which the then-unknown American went after Serena Williams. Williams, a 23-time Grand Slam champion who is planning a comeback herself after giving birth to her daughter, Olympia, soon followed Grncarov on Twitter herself. On Jan. 25, the Macedonian website Reporter.mk posted a screenshot of a real-looking direct message sent by Williams to Grncarov. Williams’ agent, Jill Smoller, did not respond to an inquiry about Williams’ contact with Grncarov. As of last weekend, @DarkoGrncarov was one of just 351 accounts Williams followed on Twitter. And then, on Sunday, Grncarov deactivated his account. With regards to his tennis career, Grncarov admitted he had a limited pedigree. He said that the only sanctioned match he ever played—a 6–0 6–0 loss in Montenegro—hadn’t actually taken place, blaming an ITF database error for that listed result. (His opponent in that match, Nikola Vukotic, told me the match did really happen.) When I asked about that nonexistent 2014 tournament in the Netherlands, the one he’d allegedly touted to the Macedonian media, he acknowledged it wasn’t an official event and said the local press had blown it out of proportion. “People from Macedonia wanted I guess to make something out of it because Macedonia is dying to have a tennis player for so long,” Grncarov said. Grncarov’s attitude changed when I asked him about the tournament in Egypt where he withdrew before playing a match, as well as the Metro report that said he’d been in a coma for six months. If the Metro timeline was right, he would’ve still been in that coma when he entered the Egypt tournament. I asked Grncarov if he’d actually been in a coma, or if it was possible it’d happened at a different time. When I said I suspected the photos and videos he’d posted on Twitter and Instagram were of other people, he cut me off completely. “You don’t have the right to do this, unprofessional,” he said, ending our conversation by blocking me on Twitter. A short while later, Grncarov deactivated his Twitter and Instagram accounts as well as his personal Facebook account. I didn’t have a chance to ask about his connection to the many Twitter accounts devoted to him, but soon many of them became locked, too. In just a few minutes, Darko Grncarov, a real person who built himself a fake life on social media, had disappeared from it altogether. No one is more confused about Grncarov’s public profile than actual Macedonian tennis players. Saska Cvetkovska, an investigative reporter in Macedonia who has focused on the fake news business there, told me that stories about the industry “inspired a whole generation of young people to do this as a primary source of income.” Cvetkovska said she doesn’t have any direct evidence tying Grncarov to a Macedonian firm. But just as Oxford’s Lisa-Marie Neudert guesses that Grncarov is working with “some sort of troll factory,” Cvetkovska suspects he’s paying a company in Macedonia to promote his brand. While Grncarov’s personal promotion doesn’t fit the standard form of fake news, the way his story spread online did fit standard patterns: The online audience that embraced and shared his story wanted to believe it was real in spite of obvious evidence to the contrary. Among those who seem to have bought what Grncarov was selling is Twitter itself, which verified his account. According to a report celebrating the achievement, Grncarov was only the seventh Macedonian athlete to be verified. It’s easier to say what’s false about Grncarov’s story than what’s true. Despite his total absence from professional tournaments, it’s possible he’s still holding out hope that he’ll become a pro tennis player. His purported coma is also unverifiable. Various outlets have reported it started in 2015 or 2016. The earliest mention of it in Macedonian press said it lasted just three days, while later reports timed it at months or a year. It’s also impossible to know if his tweets espousing progressive politics reflect his genuine beliefs or were calculated attempts to win adulation. No one is more confused about Grncarov’s public profile than actual Macedonian tennis players. “Not one tennis player from my country see him in life or see how he play tennis,” said Tomislav Jotovski, who at No. 546 is currently the top-ranked Macedonian man. Besir Durguti, currently ranked 1,825th in the world, said coverage of Grncarov was overshadowing issues faced by real Macedonian pros, such as the need for more tournaments and a national training center. Durguti said he couldn’t understand how reporters could write about Grncarov’s supposed successes when a simple check of his ITF profile would show he hadn’t played at all. “You just need to write his name on ITF and you have everything,” Durguti said. Although Adidas did send Grncarov a tweet saying “Welcome to the family,” a representative from the company told me Adidas does not in fact sponsor Grncarov. Wilson, too, said it has no relationship with Grncarov. With seemingly no real sponsorship money coming in and no real tournaments offering him invitations to play, it’s unclear what Grncarov might be getting out of his online ruse. If nothing else, he was able to draw attention from the tennis community, and lots of it. Aleksandar Bojadziski, the Macedonian reporter who was once burned by publishing false reports about Grncarov’s matches in Egypt, said he thought the story about Serena Williams contacting Grncarov, widely circulated in Macedonian media, was another complete fabrication. When I told him the real Serena Williams had indeed followed Grncarov on Twitter, his tone shifted from outrage to something closer to patriotic pride. Ben Rothenberg is a contributing writer to the New York Times on tennis and other sports and the co-host of the tennis podcast No Challenges Remaining.